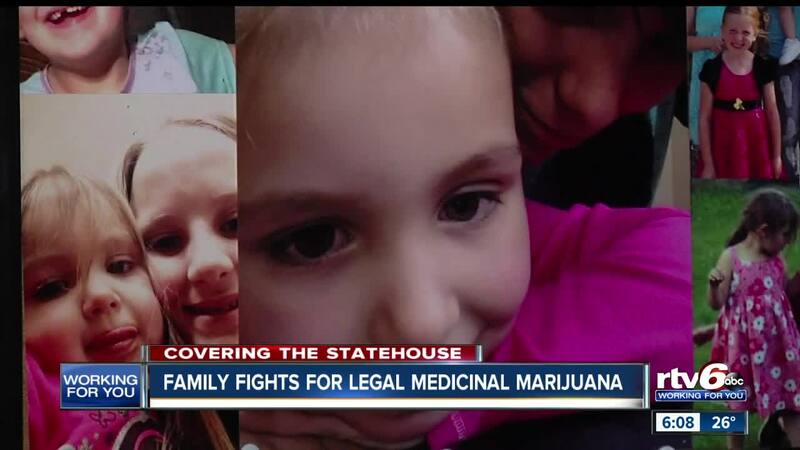 Family fights for legal medicinal marijuana. NEW CASTLE — Heidi Curtis’ house is covered with photos of her daughter, Charly. The photos are all over the walls, on countertops, on mantles. Everywhere you look, you see a photo of Charly. It’s the best way for the Curtis family to remember her. Heidi and Dave Curtis’ 6-year-old daughter, Charly, had autism and was prone to seizures. She died a month ago, after an intense seizure overnight stopped her heart. Last year, they put Charly on Keppra, an anti-seizure medication, which worked for a while. "Charly was very happy," Heidi said. "She was learning. She didn’t walk until she was 2. She didn’t talk until she was 4. Little-by-little, she was gaining skills. Things were going really well. As long as we could keep the seizures away, she could learn." But in January, Charly had her first grand mal seizure. A grand mal seizure causes loss of consciousness and muscle contractions. Charly’s lasted three-and-a-half minutes. After more seizures, she was diagnosed with Lennox-Gastaut Syndrome, a type of epilepsy with different types of seizures. Lennox-Gastaut can’t be controlled with a single type of medication, since different medications treat different types of seizures. The solution for Heidi and Dave was a new drug called Epidiolex, which contains CBD. But there were long delays in getting the drug for Charly. While they waited on the paperwork and approval process for Epidiolex, they gave Charly THC for the first time. "We thought, 'OK, it’s not legal here. But we have to do something,'" Heidi said. "We could see our little girl fading away. Her movements were getting slower, her speech was a little different. You could see the impact that these seizures were having on her developmentally." They found somebody who had just returned from Colorado with an edible form of THC- a brownie. They gave Charly a small pinch off the brownie. They didn’t give her any on the following Monday, thinking it may have been a spell that she coincidentally went through. On that Monday, she had two grand mal seizures before lunch. Heidi and Dave found another person who had returned from Colorado, and got THC oil from them. They started giving Charly two milligrams per day. She would still have seizures here and there, Heidi said. But they were much quieter and much less intense. At her next neurologist appointment, they told the doctors they had been giving her THC oil, and that it was helping. “I believe the comment was, ‘You do what you gotta do,’” Heidi said. Charly’s behavioral specialist also noticed a difference. “She was a happier, calmer child," Heidi said. "She wasn’t getting frustrated so much." After they ran out of THC oil, Dave drove overnight on Feb. 6 to Colorado to get more THC oil. They wanted the same strain as what they had been using. He was in Colorado for 45 minutes when he got the call that she was unresponsive. Heidi found her at 8:15 a.m., on the morning of Feb. 7. Charly was taken to a hospital, where she was pronounced dead at 8:55 a.m., 40 minutes after Heidi first found her in her bedroom. Doctors believe she died between 3 a.m. to 4 a.m.
An autopsy and pathology report showed that Charly went into status epilepticus, when many seizures occur close together and don’t give the person time to recover in between. Now, Dave and Heidi push for medicinal marijuana legalization in Indiana. They believe it could’ve helped Charly if they had a better idea of what exactly to give her and how much. They’re pushing Gov. Eric Holcomb and other Indiana lawmakers to support legalization and trying to help people like Charly. Rep. Jim Lucas, R-Seymour, isn’t somebody who needs pushing. Lucas is one of the most outspoken state lawmakers in support of legalization. But even he can’t say how far away Indiana is from legalization. Holcomb has repeatedly fought back against questions of legalization in Indiana. He maintained that since it’s federally illegal, Indiana is simply following the law by not allowing it. Three of Indiana’s neighboring states have legalized marijuana in one form or another. Ohio and Illinois have legalized it for medicinal use. Michigan has legalized it for recreational use. Despite Holcomb’s objections to marijuana, Heidi and Dave aren’t giving up.